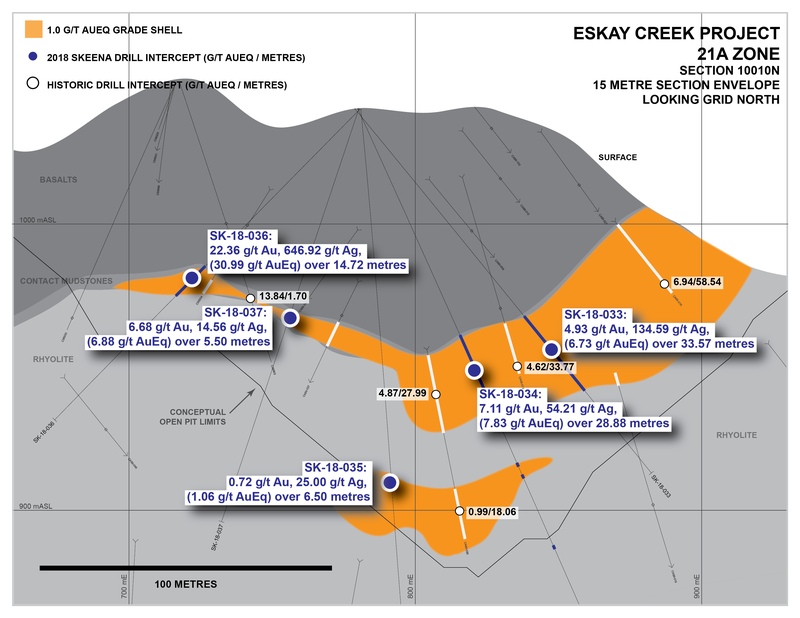 Vancouver, BC (January 15, 2019) Skeena Resources Limited (TSX.V: SKE, OTCQX: SKREF) (“Skeena” or the “Company”) is pleased to announce additional Au-Ag drill results for eight holes from the recently completed Phase I surface drilling program at the Eskay Creek Project (“Eskay Creek”) located in the Golden Triangle of British Columbia. The multifaceted Phase I program focused on the 21A, 21C and 22 Zones. Assays reported in this release are from the 21A Zone; assays from the remaining 22 Zone will be released once finalized. Reference images are presented at the end of this release as well as on the Company’s website. 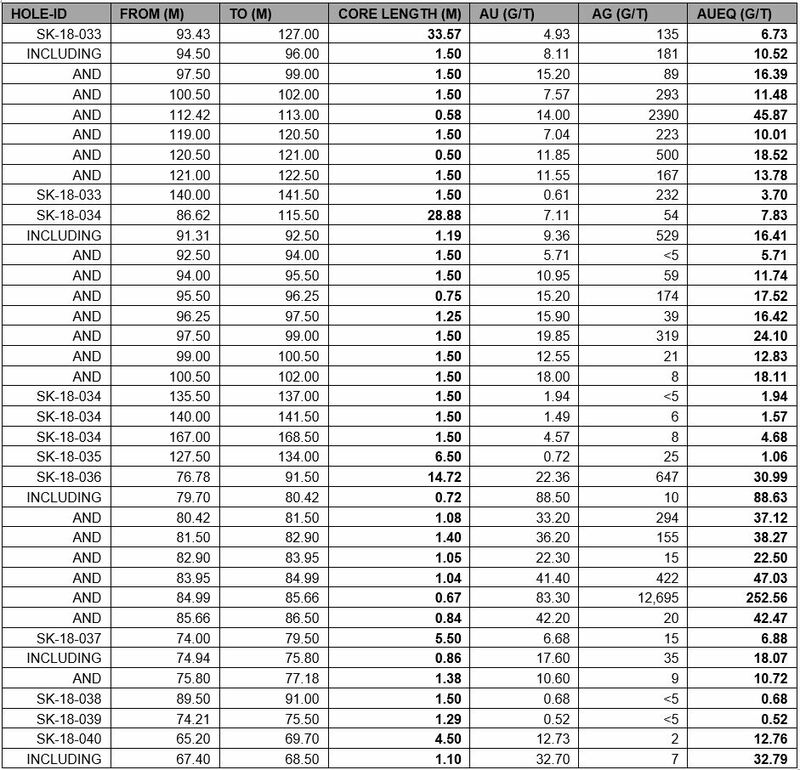 *Gold Equivalent (AuEq) calculated via the formula: Au (g/t) + [Ag (g/t) / 75]. 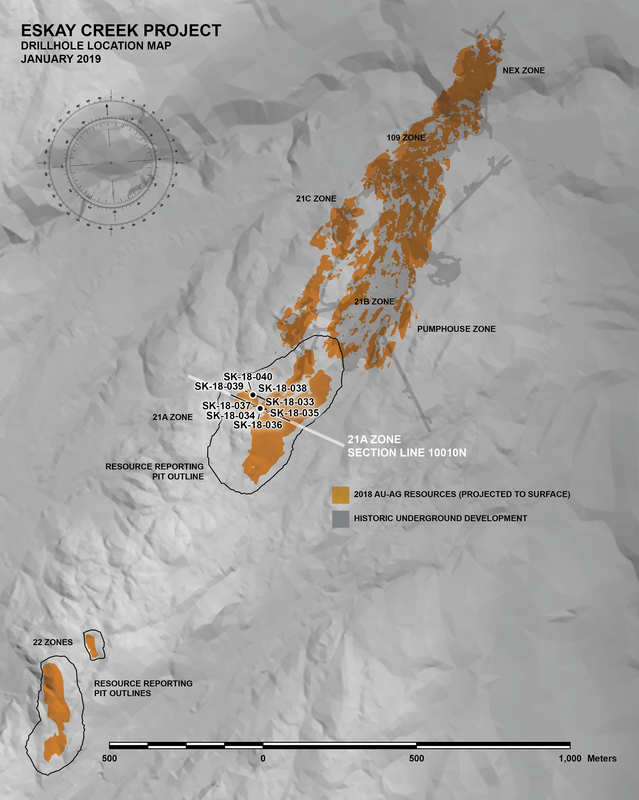 Reported core lengths represent 80-100% of true widths and are supported by well-defined mineralization geometries derived from historical drilling. Length weighted AuEq composites were constrained by geological considerations as well as a calculated 1.0 g/t AuEq assay grade cutoff assuming reasonable prospects for economic extraction via open pit mining methods. Grade capping of individual assays has not been applied to the Au and Ag assays informing the length weighted AuEq composites. Processing recoveries have not been applied to the AuEq calculation and are disclosed at 100% due to a lack of supporting information. Samples below detection limit were nulled to a value of zero.